The ingestible device is about 1.6 inches long. Inspired by a common middle-school science experiment, a team of MIT scientists with an appetite for power have developed an ingestible medical sensor powered by stomach acid. When swallowed, the sensor becomes its own battery and can beam diagnostic data from inside you. Ingestible medical devices aren't new, but traditional battery systems can pose health risks when bobbing around in the gastrointestinal tract, and miniaturization of the battery severely limits the power output. Using the body's natural acids neutralizes those issues. The device acts as its own voltaic cell using the surrounding stomach acid to facilitate electrical current, similar to the lemon-powered battery experiments often used in middle-school classrooms. In that experiment, the citric acid connects two electrodes, usually through a galvanized nail and copper pin. Researchers replicated this system with zinc and copper electrodes on the surface of their ingestible device. 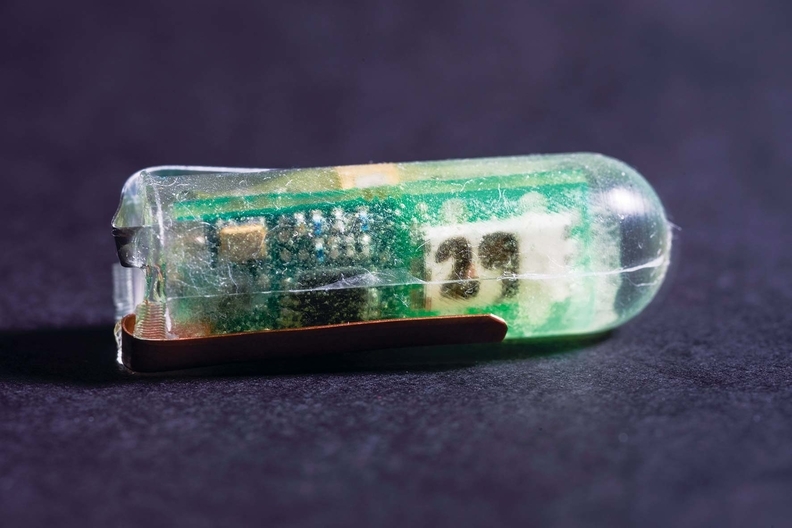 In the initial experiment, the prototype device, a pill-shaped cylinder about 1.6 inches long and a half-inch in diameter took temperature readings and beamed them from inside the stomach to a base station about 6½ feet away. That may seem like a big pill to swallow, but researchers are optimistic they could get it down to about one-third of that size by using integrated circuitry. In addition to applications as an internal sensor, the pill could also be used as a delivery device for time-released drugs. In tests on pigs, the devices took six days to work their way through the digestive tract. “You could have a self-powered pill that would monitor your vital signs … and you don't even have to think about it,” said MIT postdoc researcher Phillip Nadeau. The research was published in the Feb. 6 issue of Nature Biomedical Engineering.